14mm - 210mm holesaws suitable for use with a wide range of materials including steel, stainless steel and timber. Quick-release arbor to suit larger diameter holesaws from HS-32 to HS-152. 300mm extension bar for use with holesaws. 450mm extension bar for use with holesaws. 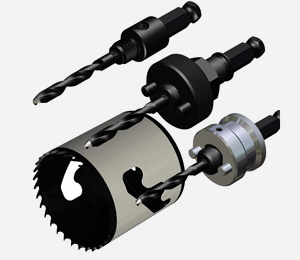 Conecut drills for enlarging existing drilled holes in steelwork up to 40mm.